Governor Jerry Brown says he will continue to push California’s climate change policies, no matter the results of November’s presidential election. “I would do what I’m doing now,” he said, speaking in Sacramento at the Doubletree Hotel on the opening night of the Society of Environmental Journalists conference, an annual meeting attended by more than 300 journalists from around the country this year. 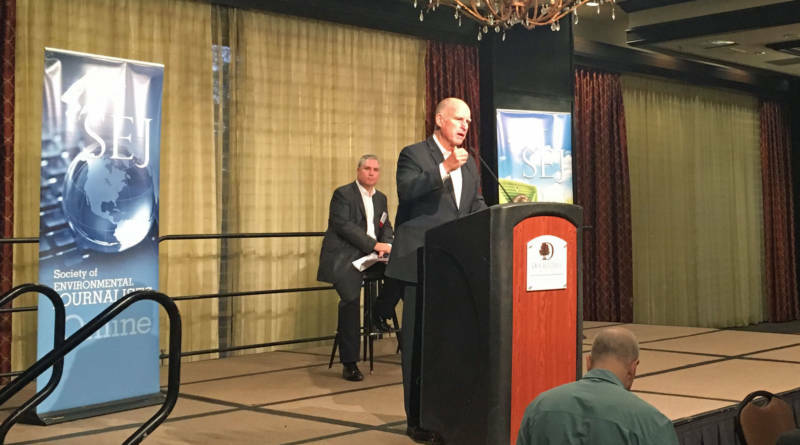 Brown, who has made climate change a centerpiece of his final term as governor, touted the group of climate change bills signed over the last month, including SB32, which set a new climate change agenda for California. It requires the state to cut greenhouse gas emissions to 40% below 1990 levels by 2030. That will mean tougher rules for factories and power plants and an ongoing expansion of solar, wind and other green energy. The bill recently passed the state legislature after a contentious debate. Brown said climate change is a slow-moving and complex problem, and America’s journalists need to do a better job of explaining it and the threats it poses if political leaders are going to make progress in averting catastrophe. He implored the room of reporters to keep writing about the widespread challenges of climate change. Brown also recently signed a bill to address what are known as “short-lived” climate pollutants -- those that have a more potent greenhouse gas effect than carbon dioxide -- such as methane, hydrofluorocarbon gases, and soot. According to NASA, nine of the 10 warmest years on record have occurred since 2000, and carbon dioxide levels in the air are at their highest in 650,000 years. The hottest year globally was 2015, and 2016 is on pace to break the record again. The SEJ conference, the nation’s largest gathering of journalists who cover environmental issues, continues through Sunday.